Clingan Steel stocks the standard grades and tempers of copper and brass as well as special grades such as alloy 425 and alloy 194. Either hot dip or electro-tinning is available on all grades. 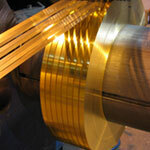 From a processing standpoint we can traverse wind, provide special edges and cut to any desired length. We are unique among copper and brass distributors in that we can process copper and brass in thicknesses up through 1/4" thick.